WHEW....There's a lot going on in this post today. Rather than creating three separate posts, I've combined them all into one! Today's Bloggers Challenge is a Color Challenge (one of my personal favorite color combos at the moment) Baja Breeze, Chocolate Chip and Vanilla (or white). Keeping with the monthly postings for the TJ Blogstravaganza - I've used the TJ Marker Watercoloring Technique, and combined it with my version of the TJ Faux Rim Shaker Technique. Finished size - 5-1/4" x 5-1/4"
First I wheeled my Christmas Chatter in Chocolate Chip ink onto my Baja Breeze card stock, placed this panel on top of my Chocolate Chip panel being careful to keep my 1/4" border then cut my circle with my Nesties. Edge Baja Breeze with sponge dauber and Chocolate Chip ink, set aside. 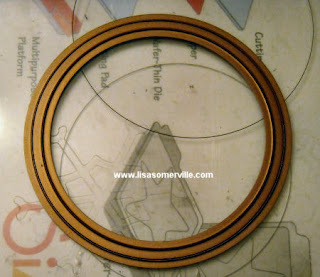 To create my rim piece - I used my Large & Small Circle Nesties. I placed the smaller circle inside the larger circle and placed them on my clear plate like this. 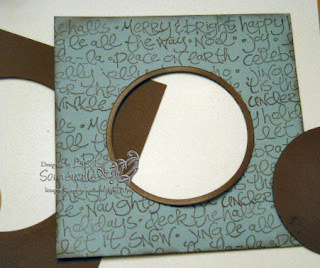 Then placed my scrap piece of Chocolate Chip card stock over the Nesties, added my cutting plate and cut, leaving me with a Chocolate Chip piece with a circle cut out, the cut out circle and my rim piece. In this photo you can see I placed my rim piece over the opening in my Baja Breeze panel. 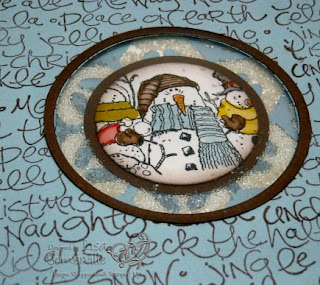 I adhered the rim piece with my glue pen to my Baja Breeze card stock that I had previously wheeled with the Christmas Chatter Wheel. Adhere this panel to your Chocolate Chip panel. Place a piece of acetate onto the chocolate chip panel, set aside. Cut a piece of Vanilla card stock the same size as your Chocolate Chip panel. Stamp your image onto Watercolor paper, cut out, and color. Adhere to a Chocolate Chip circle panel, then to a Baja Breeze piece that was cut using the Snowflake #2 Die. Place this in the center of your Vanilla panel - lay your Chocolate/Baja panel over the top to make sure your image is centered, if so, lift up and tack down. Flip over your Chocolate/Baja panel, add your Double Stick Foam tape, insert your micro beads, lay Vanilla panel over this panel, being careful to match up the edges. Adhere to Baja Breeze base card. notice when tilted the micro beads fill in the open space of the Snowflake Die. As always, if you'd like to play along with this weeks challenge, simply leave a link on this post, or if uploading to SCS, please use keyword BC73. Don't forget to stop by Pat's blog to see her TJ Blogstravaganza and the links to the other TJNL DT members. What a beautiful card. Great idea! Thanks for the tut! Gorgeous card Lisa! Thanks for sharing. Gorgeous card, great tutorial -- just love this! Wowzers!! this is AWESOME Lisa!!! great tutorial too! FABULOUS SKETCH Lisa- Thanks for the tutorial too- LOVE YOUR CARD!!!! This is really a spectacul card and so much interest in all it's design elements. Your directions are so easy to follow...so much so that I may have to give this a try! oohhh wonderful sketch and the Baja Breeze show shows up brilliantly. Love the sparkle and tutorial. nother great card lisa. I still need to go to Kohls to look for ornaments from your last project. Thanks for the tutorial. Love it! Great card Lisa - love the micro beads in the window! This is so cute and you have so many awesome ideas that you have to be added to my Reader! Great card and Thank you for the tutorial. Really Fun card Lisa...I love shaker cards and this one is so cute. This card is super cool! I didn't have any Baja Breeze this week, but it will be here on Monday and I love this color combo! Love your creativity & the uniqueness of this card! Thanks for the tutorial Lisa! Love it...the detail and beaded window are just wonderful! So super cool, Lisa!!! I just love the combination of ideas that you put together to make this one fantastic card! Love the beads on this one and your card! Great job! this is way cute! I love it!! Great card, Lisa! Thanks for sharing your technique--I'll have to give it a try. What a great idea...... Love your card. Another way to use the Spellbinders. Thanks for sharing.